Microsoft OneDrive (formerly SkyDrive) is free cloud storage from Microsoft on any device, anytime. Use OneDrive on your Windows PC or Mac to access your favorite things on all your favorite devices, including desktops, tablets, and mobile phones. It designed to enable users to easily manage, sync and transfer files. When you install Microsoft OneDrive, a folder is created on your PC that automatically syncs. Everything you put in this folder is automatically kept in sync between your computers (PC or Mac) and OneDrive.com, so you can get to your latest files from virtually anywhere. Whenever you add, change, or delete files in one location, all the other locations will be updated. All files can be managed from the OneDrive folder, without the need to use a browser. 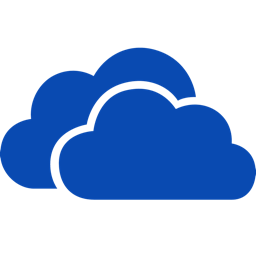 Microsoft OneDrive places an icon in the system tray, from where you will be able to access all of its features. In order to transfer files, just navigate to the OneDrive folder located on your PC and drag and drop the files you wish to transfer to your account. Easily store and share photos, videos, documents, and more – anywhere, on any device, free. Plus, get 7 GB when you sign up. Whether you’re on a Windows PC or tablet, Windows Phone, iPad, iPhone, or Android device, it’s easy to back up your photos and videos. Keep your favorite photos and videos safe, even if something happens to your device. Earn an extra 3 GB of storage when you activate camera roll back up to save photos automatically. It’s easy to view them anytime, on any device. The app works with Office, so it’s easy to create, edit, and share your documents. Save your docs and access them on any device wherever you are. Share files or entire folders, like photo albums, without attaching anything. Send an email with a link to only what you share and everything else stays private. Send them an email, link, or even post photos directly to Facebook. For Windows 8 and over, Microsoft OneDrive comes with your Microsoft account. It’s like an extra hard drive that’s available from any of the devices you use, so the files you save there are always with you. You no longer need to email files to yourself or carry around (and possibly lose) a USB flash drive. Instead, whether you’re on your laptop and working on a presentation, viewing photos from your last family vacation on your new tablet, or on your phone reviewing your shopping list, you can get to your files on OneDrive. You can add files already on your PC to OneDrive by either copying them over or moving them from your PC. When you save new files, you can choose to save them to OneDrive so you can get to them from any device and share them with other people. And, if your PC has a built-in camera, you can automatically save copies of the photos in your camera roll to OneDrive, so you’ll always have a backup.